I’m so excited to share this fun fudge recipe with you! 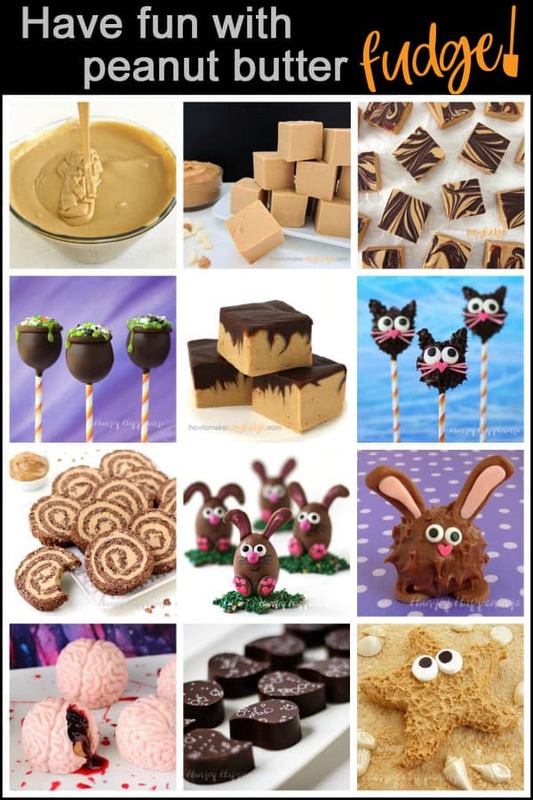 Over on my blog, Hungry Happenings, I create fun food for holidays and special occasions and I couldn’t wait to start creating some fudge food crafts for How To Make Easy Fudge. I have so many ideas to share with you but with Halloween coming up I thought it best to begin with this Jack Skellington Fudge. 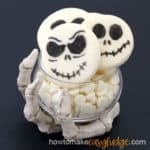 This fun fudge recipe is for all of you Nightmare Before Christmas fans who think the Pumpkin King of Halloween Town is really cool. 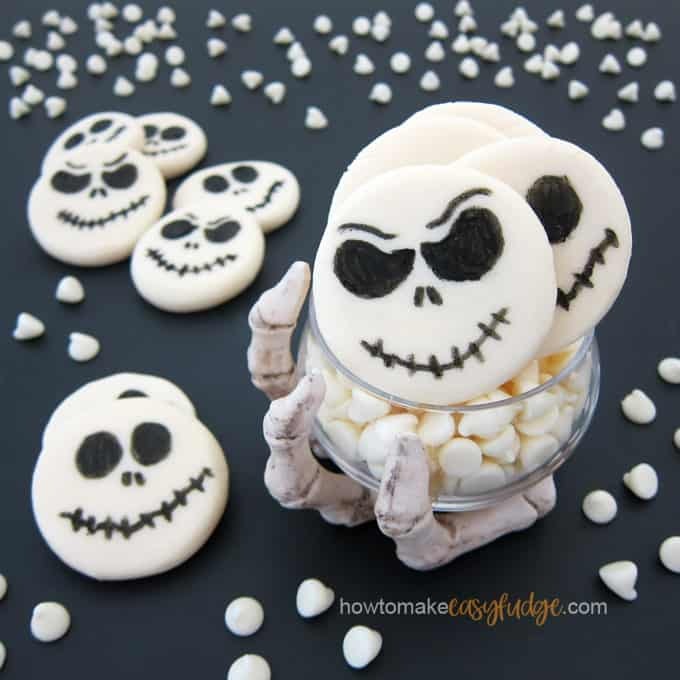 Jack Skellington is a living skeleton who embodies the spirit of Halloween and his simple facial features make him a perfect subject to make out of fudge or white chocolate bowls, cookies, or cakes. 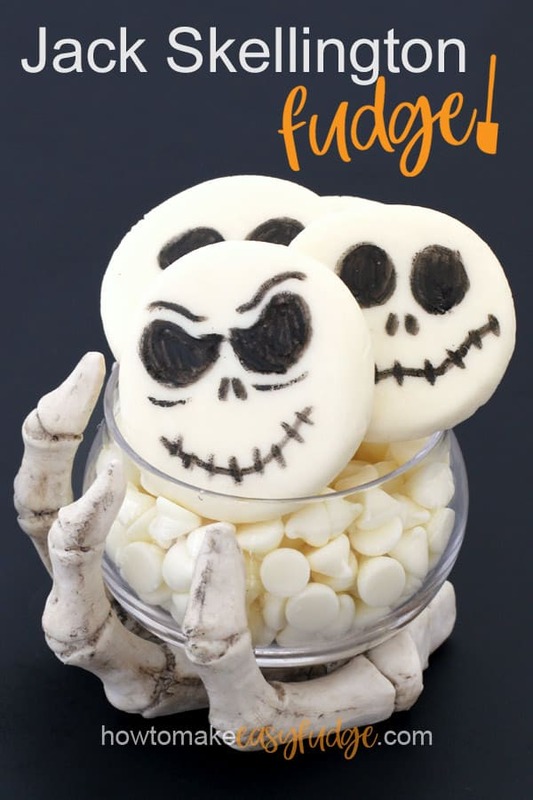 To make these slightly spooky Halloween treats you need to make a batch of 2-ingredient white chocolate fudge which will be decorated using a black food coloring marker. Add a pinch of salt, if desired, to help balance the sweetness of this easy fudge. Heat in the microwave at 70% power for 90 seconds. Remove and slowly stir until well combined and beginning to melt. Heat for an additional 15 seconds at 70% power then let the bowl sit in the microwave for 3 minutes. Remove and stir until all the white chocolate is melted. If needed, repeat the process heating for 10 second increments, resting, and stirring, until melted. DO NOT overheat the white chocolate. You can easily burn the white chocolate, so follow the steps above. If the white chocolate becomes too hot the cocoa butter or oils may seep leaving you with greasy fudge. If the fudge does look greasy, pour it into a clean bowl and let it sit for 15 minutes. If still greasy, repeat this process as needed. Cover the white chocolate fudge with plastic wrap and chill for at least 2 hours until firm. To speed up the cooling process or to quickly fix greasy fudge you can work the fudge on a marble or granite cutting board or counter top or even on a non-stick metal cookie sheet. Pour the warm fudge out onto the cool surface and flatten it to about an inch thickness. Use a plastic bench scraper or rubber spatula to scrape the fudge up into a ball then flatten again. Continue this process until the fudge is completely cooled and thickened. Can I make white chocolate fudge on the stove? Yes, pour the white chocolate and sweetened condensed milk (and salt if using) in a medium sized saucepan. Set the pan over low heat, and stir occasionally until about 75% (3/4) of the white chocolate is melted. Remove from heat and let the pan sit for 3 minutes. If all the chocolate hasn’t melted, let the pan sit another 3 minutes then stir again. You can put back on low heat if absolutely necessary. Just don’t overheat the fudge. What kind of white chocolate should I use to make this fudge? I used Nestle Premier White Morsels which are actually a confectionery coating (similar to white chocolate but made using palm kernel oil instead of cocoa butter). They are available in 24 ounces bags or smaller 12 ounce bags. You can use pure white chocolate chips (made with cocoa butter) or any white confectionery coating like Candy Melts, almond bark, or CandiQuik. You want this fudge to be rather firm so it hold’s it’s shape well. 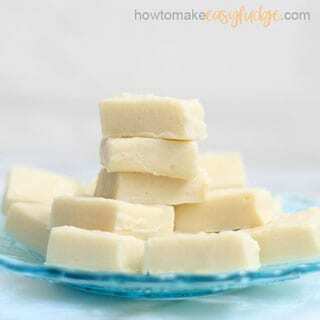 Can I use regular milk or evaporated milk to make this easy fudge recipe? No, evaporated milk and traditional cow’s milk will not work in this recipe. You need sweetened condensed milk which is evaporated milk that has been sweetened with sugar and cooked until thick. You can find sweetened condensed milk in the baking aisle of the grocery store. The cans will be right next to the cans of evaporated milk so be sure to select sweetened condensed milk. Scoop out about 2 tablespoons (approximately one ounce) of the fudge. Roll it into a ball then flatten into a disk that is about 2 1/4 inch in diameter and 3/8 inch thick. Set the disk on a silicone mat or non-stick tin foil for easy removal. You can also use wax paper. Repeat making about 32 disks. Use a black food coloring marker to draw Jack Skellington faces using different expressions. If you have trouble drawing onto the white chocolate fudge with your food coloring marker check out my Food Coloring Marker Tips page over at Hungry Happenings. You’ll find tips on keeping the food coloring ink flowing so you can get a nice design drawn onto the homemade fudge. 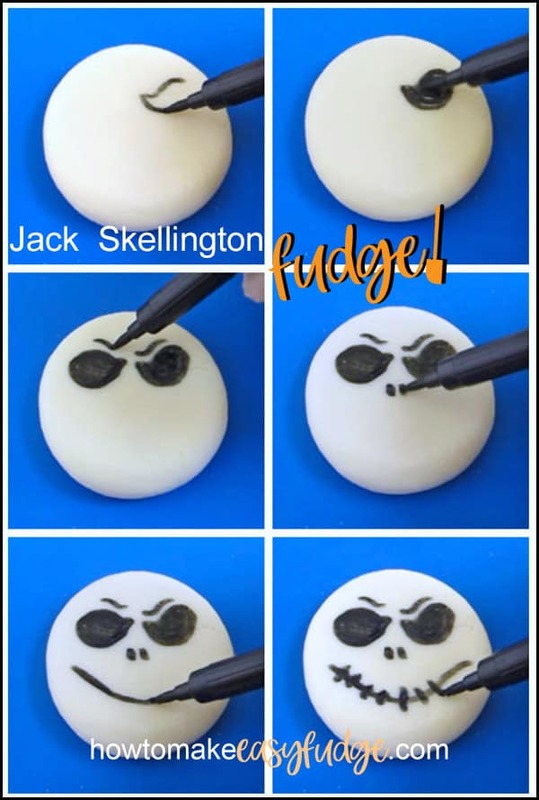 Jack Skellington is a very expressive guy so have some fun making a variety of facial expressions on your white chocolate fudge. He can look scary, happy, and even sad. 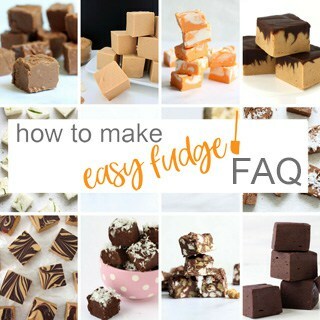 You can find supplies needed to make this easy fudge recipe from amazon (commission earned for sales). 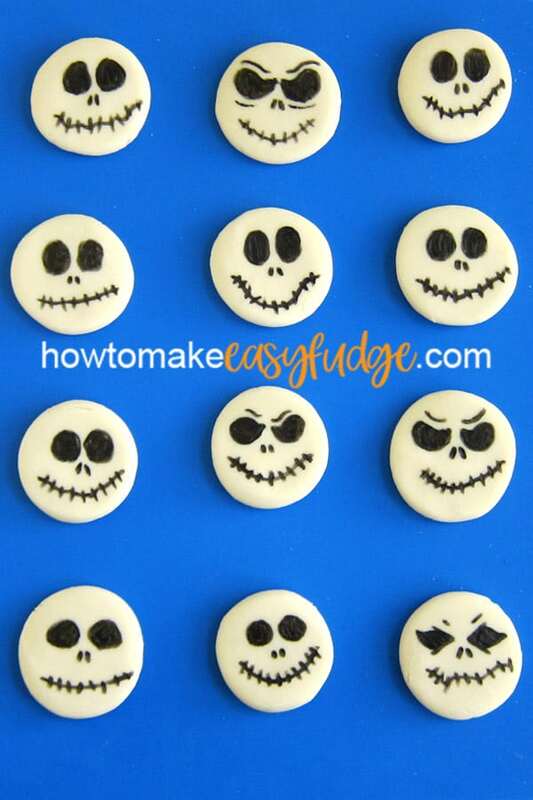 White chocolate fudge disks decorated using a black food coloring marker create fun Jack Skellington Fudge for Halloween. Combine white chocolate and sweetened condensed milk in a microwave safe bowl. Remove and slowly stir until well combined. Heat at 70% power for another 15 seconds. Allow the bowl to rest in the microwave for 3 minutes. Cover fudge with plastic wrap and chill for at least 2 hours until firm. Scoop out about 1 ounce (2 tablespoons) of white chocolate fudge and roll into a ball. Flatten into a 2 1/4 inch diameter disk. Set on a non-stick surface like a silicone mat or non-stick tin foil. Repeat creating approximately 32 fudge disks. Start with the first disc you flattened and draw Jack Skellington's face on top using a black food coloring marker. Repeat using a variety of facial expressions. Let food coloring design dry for at least 1 hour before packaging. Stove top method: combine white chocolate and sweetened condensed milk together in a saucepan set over low heat. Stir until 3/4's melted then remove from heat and let rest for 3 minutes before stirring until smooth. 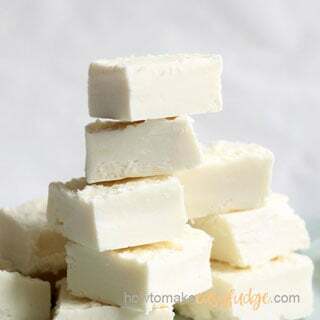 Check out your simple vanilla (white chocolate) fudge recipe too. and our White Chocolate Fudge made using vanilla frosting. Hi, This is a fantastic recipe and so much fun for Halloween! How cool is this fudge???? I love it!!!!!!!!!!!! !